P.A.T. Products, a chemical distribution and manufacturing company that has been based in Bangor for 39 years, is moving its headquarters to New Hampshire to lower its business costs. 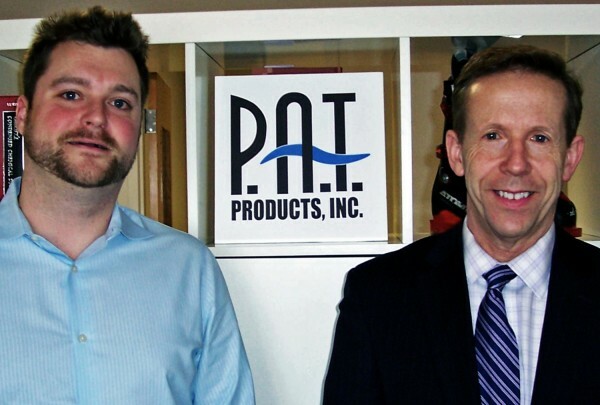 Pictured are Leo Edward Coyle (left), the company's marketing manager, and Michael Bergeron, business development manager with the New Hampshire Division of Economic Development. BANGOR, Maine — A chemical distribution and manufacturing company with a long history in Bangor says it will move its headquarters to New Hampshire to lower its business costs. P.A.T. Products, an international distributor of specialty chemicals, plastic and raw materials, has been based in Bangor for 39 years. Leo Coyle, the company’s founder and president, told the Bangor Daily News he is moving the company’s corporate headquarters to the Pease International Tradeport in Portsmouth, N.H., because of that state’s more attractive tax structure and to be closer to his markets. As a national and international distributor, Coyle said he and his employees travel a great deal. He estimates his company will save as much as $15,000 a year alone on lower airfares out of Boston, Manchester, N.H., and Portland. P.A.T. Products currently employs seven people in Bangor, Coyle said, with no plan for immediate layoffs. The business’ address is 44 Central St. in Bangor. While the company will move its headquarters to Portsmouth, some small manufacturing activities will remain in Bangor for the time being, Coyle said. New Hampshire didn’t offer P.A.T. Products any incentives to relocate, Coyle said. “Any time a business leaves Maine it is unfortunate,” Adrienne Bennett, press secretary for Gov. Paul LePage, said on Wednesday. To her knowledge, Coyle did not reach out to anyone in Augusta for help avoiding the need for such a move — though she admits the governor’s office would not have been able to do anything about lowering airfares. While LePage acknowledges the challenges, including a corporate income tax 16 percent higher than the national average, Bennett said his administration has done several things to try to improve the state’s business climate, including the business-friendly communities program, the Red Tape hotline and health care reform. “Another issue the governor remains consistent and committed to is lowering energy and electricity costs. Unfortunately, without like-minded elected officials, Maine cannot become more competitive. These two issues addressed appropriately with policy have the potential to help Maine grow its economy,” Bennett said. The news of P.A.T. Products’ planned move was first announced in a news release from the New Hampshire Department of Resources and Economic Development. Coyle was unaware of the release’s existence. Though he confirmed the company was moving, he contradicted a statement in the release that the company planned to hire six people in New Hampshire in the next year. Having lived in Maine for 40 years, Coyle said he naturally felt conflicted about moving the company. “I’m not trying to bash Maine,” he said, adding that it’s a great place to raise children. But during his 40 years living in the state, he said he has become frustrated by what he sees as Maine’s attitude toward business and industry.